A road in a village flooded in 2015 has reopened after it was submerged again when a water main burst. 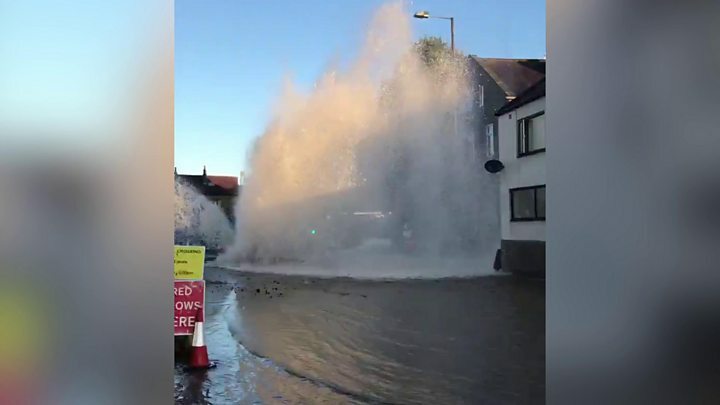 Schools, businesses and a local library were forced to close after the pipe burst on Burnley Road, in Mytholmroyd, West Yorkshire, on Wednesday morning. 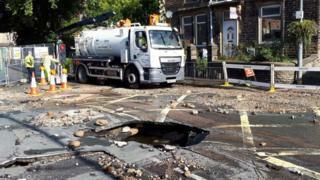 Calderdale Council said it had asked engineers to work around the clock to repair the damage caused to the road. Yorkshire Water thanked the community for "rallying around our colleagues" to help them fix the water main. Dramatic footage shot by Louis Shaw showed a torrent of water spewing through the surface of the road at about 07:00 BST outside the Dusty Miller pub, which was badly flooded in 2015. The water company said the cause of the burst was unknown but an investigation was ongoing. Councillor Scott Archer-Patient said: "Many in the village (including the Mytholmroyd flood wardens) turned out in force to assist in any way possible, from diverting traffic to distributing bottled water. "After the 2015 Boxing Day floods this community has pulled together and we are thankful that all the flood alleviation works here are continuing at a speedy pace." Image caption Yorkshire Water thanked the community for supporting its contractors to "reopen the road"
Katrina Feather, customer service manager at Yorkshire Water, said: "This has been a real team effort to get the road back open again." More than 3,000 properties were flooded in the West Yorkshire valley on 26 December 2015. Communities in Hebden Bridge, Mytholmroyd, Sowerby Bridge and other areas were hit. They have since received more than £8m in grants to improve their flood defences. Landlady at the Dusty Miller Carole Pollitt said the pub only reopened six weeks ago following renovation work as a result of flood damage in 2015.